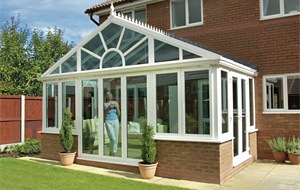 The Stylish Gable End or Pavillion Conservatory. The self build gable end conservatory styled roof is probably the oldest roof design. This style of roof can by found in orangeries which are brick walled structures that had glass roofs built for the purpose of growing fruit and exotic plants, in the 1600's. The standard DIY gable end conservatory can have a width and projection of around six metres, when using polycarbonate and around five metres when glazing the roof with double glazed sealed units. The structural tie bar is an integral part of this roof design as the frames offer little lateral support. From a design point of view the DIY gable end kit can be used on just about any style architecture. When building on a period property detailed finials and cresting can be applied and a classic wagon wheel glazing feature can fitted into the glazing in the gable itself. On a modern property, where clean, straight lines are required, the finials and cresting can be omitted and a plain, mullioned gable end feature can be installed. The gable end style of conservatory offers the most 'wow' factor when viewed from inside as the vertical gable offers a much higher view of the sky and creates the feeling of more volume. Selected conservatories half price when you order before 30th Apr 2019. Copyright © 2010-2019 by SBC - All rights reserved.